So I got my shopping delivered today and when I was putting away some cereal I noticed some shoots coming out of one of the boxes in the cupboard, I was like “wtf?”. Upon closer inspection it appears that I had somehow lost a spud in the box of cereal and having not touched the stuff for a few months it has flowered into a beautiful tentacled beast. Ah… Good ole Morrisons. Always supplying high quality, unexpected, deadly potatoes to those who need it the most. Don’t eat it, potatoes that have sprouted are poisonous. You get your groceries delivered? Lazy. 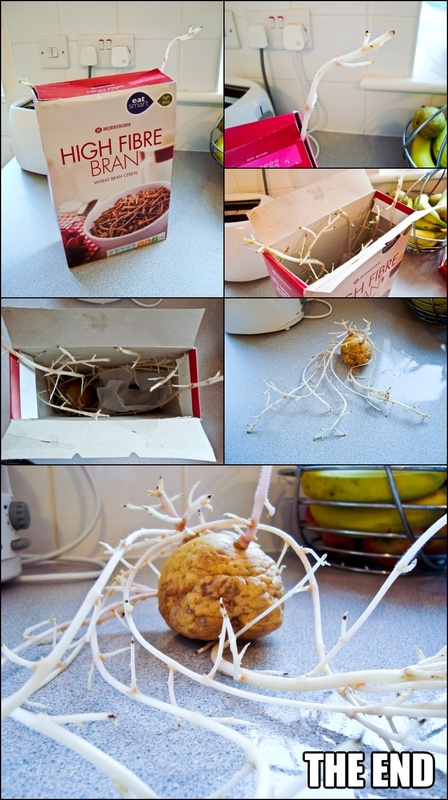 I had misread the title as “Spud Brain” yet that works. That is what we call a beautiful disaster. Eat it, I dare ya. how in the hell do you lose a potato in box of cereal? now that’s high fiber cereal! you are just rank cross!